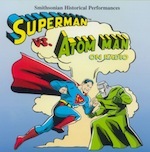 The sinister Sidney orders the Atom Man to cease his deadly kryptonite attack on the Man of Steel to preserve Miller’s atomic might. Miller and Jito carry Clark Kent’s unconscious body in to a secret room hidden beneath the Fat Man’s garage. hey plan to starve Superman to death by denying the unconscious Man of Steel food and water.